This looks really great - looking forward to giving it a shot with my warden. With a programming background, I'm very familiar with the way events work so I'll be seeing how complex I can make some of these sequences. Last edited by PuckByter : 06-15-2015 at 12:32 PM. I've taken a first stab at documenting the Conditional (if...then...else...) feature, here. Please let me know if anything needs clarification. 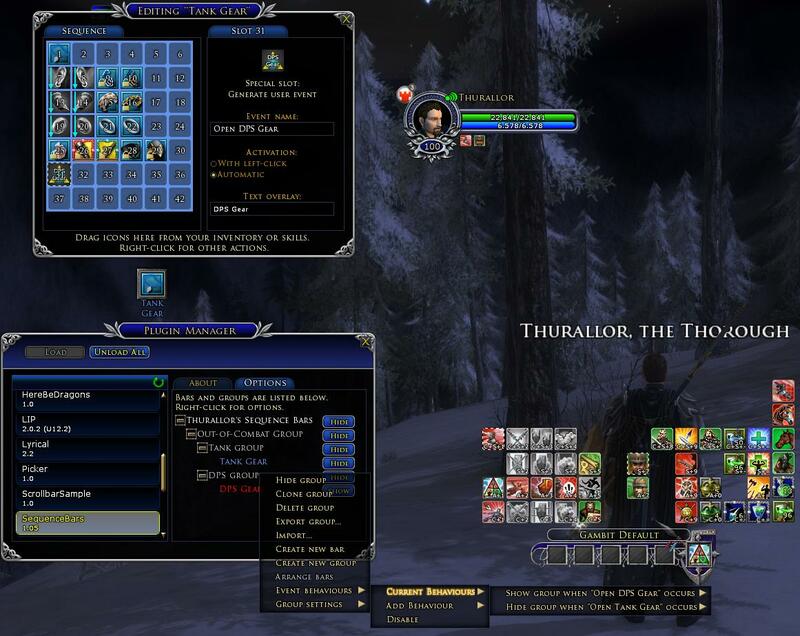 Greetings, and thank you for crafting this plugin for LOTRO. I find it more straight-forward to create/manage 'bars' than with TitanBar! The "Overlay" text showing overtop the actual /command on the "Chat Command" button. This makes it simply too difficult to 'read' what the button is set up to do (i.e. : the two different texts are jumbled together). Perhaps not showing the /command text when something is provided as "Overlay" text. When you select the slot in the Sequence Editor, there is an "Icon" slider that allows you to choose an alternate background icon that does not contain any text. Then you can type whatever you want in the "Text Overlay" field. Or alternatively, you can use the default icon and leave the "Text Overlay" blank. Perhaps I should make these two features mutually exclusive since, like you pointed out, nobody wants to see text overlaying other text. The 'UserCreatedEvent' can detect the state of both character and target effects (de/buffs) and the character's own skills availability/ready state. The only thing I do see 'missing', that I personally utilize, is the fishing hobby. Your plugin does directly handle a character's skills, as I mentioned, but not the only available hobby. Is there a particular reasoning (i.e. : LUA restrictions, etc.) this is not/cannot be handled with this (or any other?) plugin? Unfortunately the Lua API doesn't include any interface for dealing with Hobby skills. Could/Would you provide a more thorough explaination of how best to utilize the 'Conditional' (IF/THEN; IF/THEN/ELSE) feature? I've been meaning to do that for a while. I think I'll probably make another demo video about all of the new features I've added since I made that first video. Can't promise you a date though; it'll be whenever I can get around to it. I'll be making another release with some significant new features in the next couple of days. Last edited by chaotic2091 : 05-29-2015 at 10:16 PM. Thanks for the feedback. That functionality shouldn't be too hard to add. I'll look into it and post an update shortly. Edit: Added in version 1.11. Please give it a try! Last edited by Thurallor : 04-03-2015 at 01:32 AM. I have noticed that when I clear my screen so I can take a screen shot the icons for the Sequence Bars stay. This is very frustrating when I want a clean screen for the screen shot. Thanks for the reply, explanation, and creative work around. Bummer that Turbine hasn't included this in their API. One thing I could do would be to add an event behavior that moves a bar under the mouse cursor, wherever it happens to be. Then you could press your shortcut key, then click the mouse a bunch of times to execute the skills/items, without having to go find the bar with your mouse. I'll look into this. This is now implemented (in version 1.06). Enable the bar to be activated by some keyboard input or cmd. I'm thinking of a command such as '/seqbar "DPS GEAR"' that could then be put into a shortcut on one of the quickslot bars. That way, something like 'ctrl-=' could be pressed rapidly (or a keyboard/mouse with macro capability could do the pressing) vs clicking the Icon. I typed a long reply (below) describing how to use the new "/sb" chat command, before I fully realized what you're asking for. Unfortunately, there is no way to do what you've requested. You have to actually click the icons to execute the skills. The best I can do is to put the icons under your mouse cursor so you can click them rapidly. This is one of the limitations of the Lua API that Turbine put in intentionally. As shown in my video above, you can create a "user event" . Then you can set event behaviours (such as showing or hiding bars) when the user event occurs. As of version 1.05, you can now trigger a user event using the "/sb" command in the chat window. At the end of my "Tank Gear" sequence, I generate a user event called "Open DPS Gear". At the end of my "DPS Gear" sequence, I generate a user event called "Open Tank Gear". My "DPS Group" is set to show its bars when the "Open DPS Gear" event occurs, and hide its bars when the "Open Tank Gear" event occurs. My "Tank Group" is set to show its bars when the "Open Tank Gear" event occurs, and hide its bars when the "Open DPS Gear" event ocurs. The nice thing about this approach is that with a single command, you can show or hide multiple bars. If I simply had "/sb show <barname>" and "/sb hide <barname>" commands, you would have to click two shortcuts: one to show your "DPS Gear" bar, and another to hide your "Tank Gear" bar. Maybe this is too complicated for people to understand, and I should just go ahead and create the "show" and "hide" commands. But I fear that would encourage people to do it the easy way and never learn to do it the cool way. Thanks for using my plugin and for the feedback. Last edited by Thurallor : 01-02-2015 at 12:52 PM. Last edited by PilotSteveB : 01-01-2015 at 10:58 PM. This is really cool. Thank you for making this and sharing it.